recently opened its door in Miami Beach. OTL in the Design District. all walks including carnivores who will come just for the amazing food and music. experience that draws people in whether they are looking for lunch or dinner. such as coconut ceviche, cauliflower tots, a burger, plant-based crab cakes and an “18-carrot” dog. The restaurant also offers a vegetable sushi bar and cold-pressed cocktails. know how to efficiently deal with guests, getting them promptly back into their cars and on the road. Elite Parking wants to congratulate Hamilton Ramirez for receiving February’s employee of the month! staff, provides on-site training, tracks tickets and completes daily reports. in the parking management industry. 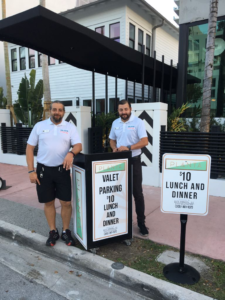 Elite Parking is excited to be overseeing the valet parking operations for one of the most vibrant restaurants in South Beach; Estiatorio Milos. 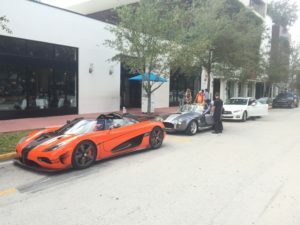 Elite Parking is known throughout Southeast Florida for providing first-class valet and parking and logistics to a variety of venues that include luxury hotels, full-scale parking garages, residences and fine dining establishments. 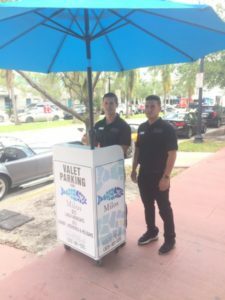 “We are happy to be chosen as the valet service provider for such a prestigious restaurant group, which is recognized throughout the world as one of the finest Mediterranean seafood restaurants,” said Elite’s Managing Member, Ruben Perez-Sanchez. Estiatorio Milos was founded by acclaimed chef Costas Spiliadis who has made it an unparalleled culinary destination in cities such as New York, Montreal, Miami, Athens, Las Vegas and London. Situated in the heart of South of fifth, Estiatorio Milos is renowned for its exceptional fish and seafood. Guests indulge in the refined Grecian culinary experience surrounded by elegance and distinct sophistication. Milos is located at 730 1st Street, Miami, Fl. Elite Parking works continuously to successfully meet the demands of four and five star properties. This requires maintaining a consistent level of the service and making sure staff follows the highest standards of service across the board. Elite fully understands that their staff are a direct reflection of each clients’ reputation and brand.